A spell of reasonably dry weather has allowed the High Pasture Cave Project team to make good progress at the site, especially in Trench 6, which is located in Bone Passage where the man-made stairwell meets the natural cave. 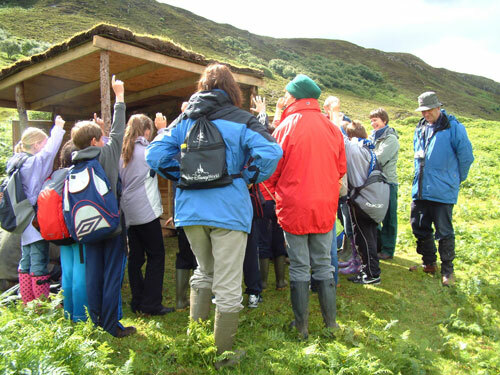 Excavations in the trench have produced a wide range of artefacts and ecofacts, providing further evidence to support our initial interpretations that the site was of major importance to the prehistoric inhabitants of the region. To see digital images of the finds from Trench 6 and from other areas of the site visit the Latest Finds section. During the excavation of Trench 6 several different forms of deposit have been uncovered. Contemporary with the use of the stairs leading into the passage a dark, charcoal-rich layer of sediment was uncovered that contained isolated deposits of animal bone and fire-cracked stone (context C604). Artefacts associated with this layer included pebble tools, a fine bone point, pottery sherds, glass beads, a stone palette, perforated antler plates and a large granite saddle quern. Virtually all of these items had been deposited at the transitional point where the man-made stairwell meets the natural cave, indicating that this was a very special place within the High Pasture’s site. The wet-sieving residues also produced charred cereal grains (mainly barley) and burnt hazelnut shell. The archaeological deposit excavated below C604 (C605) was quite different, comprising a orange-coloured gritty sediment, that contained significant quantities of intensively processed animal bone and fire-cracked stone. However, the make-up of this context also varies across the length and breadth of the trench. Two rows of stone, some of which are small paving slabs, are aligned down the length of the trench (and passage) around 0.7 metres apart and appear to correspond with the highest section of the passage roof. Therefore, the rows of stone may have provided a form of kerbed walk-way through the passage, allowing the maximum amount of headroom for people accessing the cave. Also of interest is the relationship of context C605 to the base of the staircase. The deposit appears to run below the bottom step exposed at the present time in Trench 6, which suggests we are looking at a surface used prior to the construction of the stairwell. Could this be a Bronze Age horizon within the archaeological deposits we are investigating in Bone Passage? The sediments and the archaeological material they contain also show marked differences, providing further evidence to indicate that the ‘walk-way’ and the areas outside it were used in different ways by the people entering the cave. For example, the quite compact material within the walk-way contains isolated deposits of animal bone and relatively intact fire-cracked pebbles, with little in the way of burnt bone. However, the areas to each side of the walk-way contain a loose, gritty material that has large quantities of intensively processed animal bone, burnt bone and fire-cracked stone. These areas also contain less charcoal lumps than the walk-way. Excavation of context C605 also produced a wide range of artefacts including pebble tools, a small bone point, a fine bone or ivory bead, a flint thumbnail scraper and a human molar (tooth). 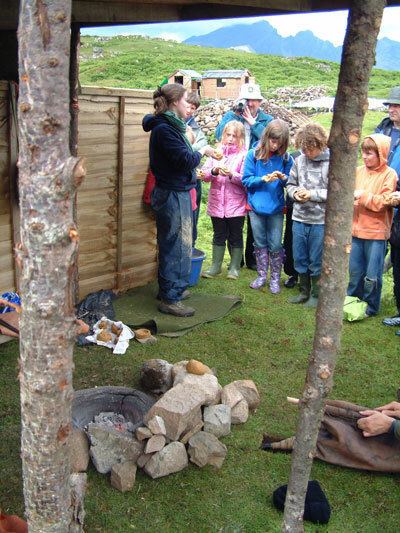 But the main concentration of artefacts was recovered from the surface of a small step or paving slab at the base of the stairwell, where we found a beautifully-made soapstone spindle whorl or pendant, a limestone pendant and a cache of 8 bone points. These items were found in such a small space on the step it is possible that they may have been deposited in some form of organic container, that has since perished, or were bound together in some manner. The bone points are expedient-type tools that still retain cut-marks from manufacture and appear to have seen little use before deposition in the cave. Is it possible that some of the items intended for deposition in the cave were manufactured very quickly for this purpose? The removal of context C606 during the next week of work at the site should produce significant quantities of animal bone and it will be interesting to see if the quality and quantity of material recovered from Trench 6 continues. Excavation has been more sporadic within the surface trenches due to the unsettled weather conditions of the past two weeks. However, we have managed to start the extension of Trench 7 to investigate the potential ‘roundhouse’ wall, while work has continued in Trenches 7 and 9. The excavation of Trench 7, within the ‘roundhouse’ is now almost complete and we have uncovered two unusual features right on the junction of the trench with the back-filled Trench 3. 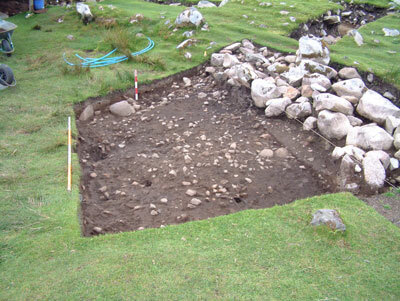 The first, which is located immediately to the west of the roundhouse entrance investigated in Trench 3 in 2005, is a stone-edged pit feature. The feature has been formed where the natural karstic clay falls away towards the deep sections of Trench 2, but unfortunately, no finds were recovered from the sediments within the feature. The second feature, which is also located in the baulk of the trench and to the south of the stone-edged pit, appears to be some form of stone-lined tank. 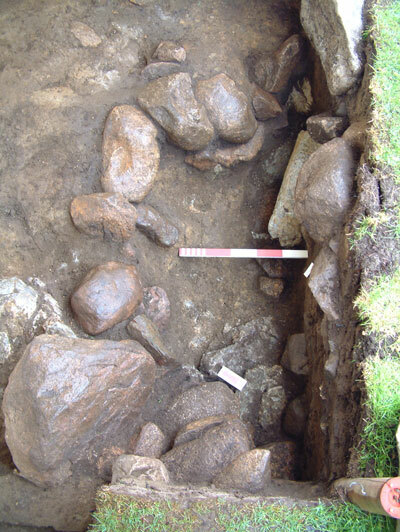 Unfortunately, the structure has been disturbed in the past, but some of the lining stones are still in place and appear to have some form of grey ‘luting’ clay between them. Charcoal deposits were also recovered from the base of the feature. 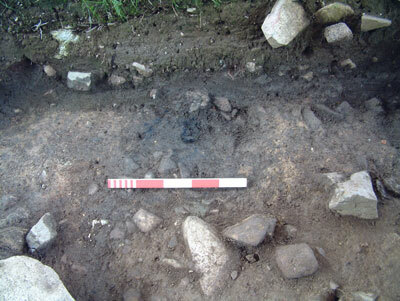 The feature lies immediately to the east of a shallow scoop in the natural clay in Trench 7 that contained a significant quantity of fire-cracked stone and the two features may be the result of cooking processes taking place at the site. Work has also progressed relatively well in Trench 9, the extension to Trench 5, to investigate the extent of the burnt mound in this sector of the site. After removal of the turf, which is quite thin over the underlying stone, a dense bracken root was encountered. 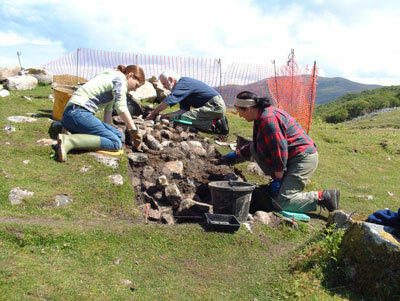 This caused some complaints from our three volunteers undertaking the excavation work, but Mike, Ann and Gemma soon had the underlying stonework cleaned and ready for initial recording. The exposed surface comprised a mass of chaotic granite cobbles and larger stone, but in the north sector of the trench a circular feature was uncovered. Unfortunately, no finds were recovered from this feature which may be some form of pit, post-hole, or hearth setting. 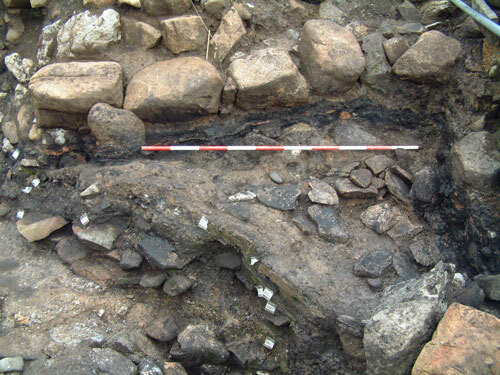 After removal of the setting and the other mass of stone within the upper contexts of the trench, a fragment of degraded walling was uncovered. This may be associated with the small circular structure uncovered in Trench 5 in 2005. Below this we uncovered the surface of the burnt mound material, comprising significant quantities of fire-cracked pebbles and stone. The trench is still under excavation and over 0.5 metres of burnt mound material removed, in which we have uncovered only a small amount of finds including degraded pottery sherds, animal teeth and small fragments of charcoal. However, we have found several fragments of iron slag within the burnt mound material, two of these being quite large. The adhering clay deposits on the slag may indicate that these pieces may have formed part of a furnace base within the natural karstic clay on site. For details of the finds mentioned above, including digital images, visit the Latest Finds page. 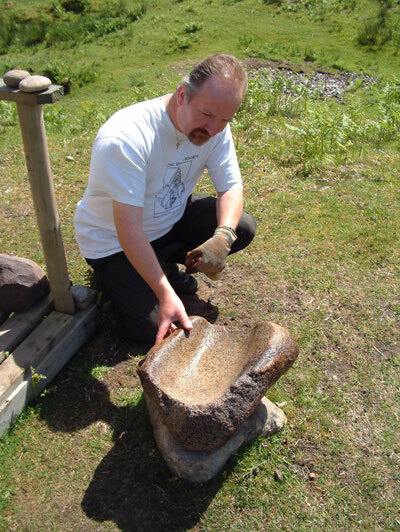 How does a saddle quern work? It was exciting experience, because not every day someone finds a prehistoric needle just in front of me. Thank you.